Albuquerque International Airport (ABQ) is approximately 75 miles north of the City of Socorro. If you fly into Albuquerque and are coming to Socorro, look for signs to I-25 South (Las Cruces) as you exit the airport – the freeway is less than a mile away. The next closest major airport is El Paso (Texas) International Airport (ELP), 200 miles south of Socorro. Information on the Socorro Airport is on the Socorro Airport page. Socorro’s latitude and altitude combine to give it a pleasant year-round climate. Socorro is just far enough south to be spared many of the storms that often touch northern New Mexico. Its elevation of approximately 4,585 feet spares us the extreme heat. The altitude also provides four distinct but temperate seasons. Socorro summer high temperature averages are in the mid 90s, with no more than 20 days when the temperature reaches over 100F. Winter high temperature averages are in the mid 50s, and winter nights seldom drop to 0F. Socorro’s low average humidity, little cloud cover, and valley location encourage formation of significant atmospheric stable layers. Normally during the day, air temperature decreases with altitude, but after a clear, calm night, the air next to the ground becomes cooler than the air above. Socorro (literally to give aid, to give succor) was indeed a source of help to the first expedition of Spanish families traveling north from Mexico in 1598, led by Don Juan de Oñate y Salazar. Socorro’s first inhabitants, Piro-speaking people of the Teypana Pueblo, welcomed the scouting party of Oñate and his men. They showed no fear of the strangers, according to Oñate’s official log, and with hand signs told the group what lay ahead. When the Teypana inhabitants unexpectedly gave the group a large gift of corn, Oñate renamed the pueblo Socorro. Nothing remains of Teypana today, but on the east edge of Socorro County, the ruins of the vast Gran Quivira Pueblo stand as tribute to the great trade culture of the Pueblo Indians. One of three pueblos of the Salinas Missions National Monument, the ruins of Gran Quivira show the excellent masonry of their architecture. Oñate’s expedition began a century of trade along the El Camino Real (the Royal Road). From its early days of caravans bringing missionaries and supplies, the road over its 223-year history connected the New Mexico Territory to Mexico and Spain. Little parajes (resting places) sprang up along the Rio Grande from Paraje de Fra Cristobal, at the northern end of Jornada del Muerto, to Casa Colorado in the northern end of today’s Socorro County. A bit of the oldest trail in North America can still be traversed along a dirt road section east of Escondida. El Camino Real is beginning to receive the recognition it deserves in history. A visitors center detailing the road’s history opened in the fall of 2005 at the south end of Socorro County, overlooking a section of the historic El Camino Real. San Miguel Mission, in the City of Socorro, was one of four missions built among the Piro Pueblos during the 1600s. Spanish families surrounded the mission, farming and ranching on land given them in Spanish land grants. During the Pueblo Revolt of 1680, the Teypanas left with the Spaniards, establishing a new community further south. 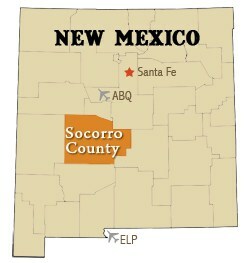 Socorro was not re-founded as a community again until late 1816. In 1854, Fort Craig was built at the north end of Jornada del Muerto, to guard against Apache and Navajo raids and to protect El Camino Real. With the outbreak of the Civil War, the fort remained a Union Army Post. On February 21, 1862, Confederate troops under General H.H. Sibley engaged the Union Army troops under Colonel R.S. Canby. Confederates won the Battle of Valverde, fought upstream from the fort at the Valverde Crossing. Fort Craig later was home to the Buffalo Soldiers, regiments of Black soldiers who served after the Civil War. Today, the Fort is open from dawn to dusk, seven days a week. Maintained by the Bureau of Land Management, the site has interpretive signs and a campsite. The Battle of Valverde is re-enacted each year, on a weekend near its February anniversary date. Activities are centered in the City of Socorro and include re-enactments of the battle, the “liberation” of the town of Socorro and other events. The arrival of the railroad in the 1880s brought miners, merchants, and cattlemen to Socorro County. In the west, Magdalena became the center of mining activities and the “End of the Trail” for cattle drives from farther west. The town of Socorro sported a grain mill, a brewery and smelters to process the ores. California mission style homes and buildings took their place among the adobes in the booming towns. In 1889, the area’s first university opened: the New Mexico School of Mines, now known as New Mexico Tech. NM Tech has garnered an international reputation in the sciences and is consistently rated as a top college nationally. The Tech campus is also home to the National Radio Astronomy Observatory’s VLA and VLBA, and several associated entities. The beginning of World War II saw an increase in activity in Socorro County’s southeast quarter. With the increase in temporary workers traveling through, San Antonio’s Frank Chavez answered a need by opening a small restaurant in his store, and created the first green chile hamburger at the Owl Bar and Cafe. The workers wouldn’t say what they were doing but did tell residents to watch for something big on the morning of July 16, 1945. Many Socorroans remember the light of the first atomic blast at White Sands Missile Range. Trinity Site is now a monument, open to the public once a year. Socorro residents maintain an independent attitude, reminiscent of its “Wild West” past. In the ’50s, a few citizens trumpeted the idea that Socorro had somehow escaped all legal transfers from Spain to Mexico to the U.S. and started a secession campaign. License plates reading “Free State of Socorro” can still be seen. Submitted by Gwen Roath, a former reporter, editor and publisher of Steppin’ Out, a bi-monthly guide to regional arts and events.